A tomato-based ground beef and sausage meat sauce, baked with rotini pasta and a mix of Cheddar and Parmesan cheeses. Wow, has this cold and flu season been a challenge for me this year. You hear about how frightening it is around the country, but when it hits home and you experience it in your family multiple times, it's exhausting. Course, The Cajun, who is exposed to those pesky little germs much more often than me, and has such a strong constitution and rock solid immune system, he's done well fighting it, unlike me. I'm feeling okay today, but that seems subject to change at any time this winter. Hope y'all are faring better than I have, whew! Even though my taste buds have yet to recover, still gotta feed the man, so here's another quick and easy dish and I'm sure all for that here lately! It's a mix of ground beef and sausage baked in a tomato-based sauce and layers of cheese. Be sure to undercook the pasta a tad so it stays more firm in the baking process. Instead of making a white sauce, I went with our southern béchamel, aka cream of mushroom soup, although if you're opposed to using that, I've included a homemade béchamel sauce down in the cook's notes in the recipe. As cheeses go, I wanted to use a combination of mozzarella and Parmesan, but my mozzarella had seen better days, so I pulled out the tail end of a block of sharp cheddar I needed to use up anyway. Use whatever your favorites are. I also used my Copper Chef pan which is about 9-1/2 inches square but deep, with a total capacity of 4.5 quarts, about the same as a 9 x 13 inch baking pan. 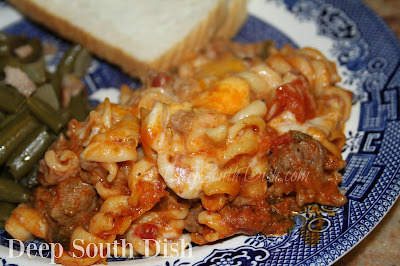 Since this is a layered casserole, if you're also using an oven safe skillet from start to finish, just transfer half of pasta and meat sauce to a bowl, wipe sides of skillet and layer in as written before transferring the skillet to the oven. For more of my favorite casserole dishes, pop by my Pinterest page! Preheat oven to 350 degrees F. Boil pasta in salted water, 2 minutes shorter than package directions; drain, rinse to stop the cooking process and set aside. Butter a 9 x 13 inch baking dish; set aside. Meanwhile, heat oil in a deep sided skillet or large saucepan. Add onion and bell pepper; cook until softened about 3 minutes, add garlic and cook another minute. Add ground beef and sausage and cook until no longer pink, breaking up meat, but leaving in large chunks. Drain off any excess fat. Add seasonings, pasta sauce and canned tomatoes; bring to a boil, reduce to simmer and cook for 20 minutes. Remove bay leaves, taste and adjust seasonings, adding salt if needed. Add cooked pasta to meat sauce and mix together. Mix together cheeses in a separate bowl. Layer 1/2 of the pasta and meat sauce in prepared baking dish, dabbing 1/2 of the cream of mushroom on top. Smooth soup out. Sprinkle on half the cheese mix and repeat layers. Cover and bake at 350 degrees F for 25 minutes; uncover and bake another 5 minutes or until bubbly. Cook's Notes: Omit the cream of mushroom and substitute a homemade béchamel sauce, made from 2 tablespoons butter 2 tablespoons flour and about 1 cup milk. If using an oven safe skillet, transfer half of pasta and meat sauce to a bowl, wipe sides of skillet and layer with cheeses as above before transferring to oven.